HR. 477, The Small Business Mergers, Acquisitions, Sales & Brokerage Simplification Act of 2017, recently passed the US House of Representatives UNANIMOUSLY (426-0). With all of the other issues confronting Congress, time is running out to get this bill passed by the US Senate before the end of this session. 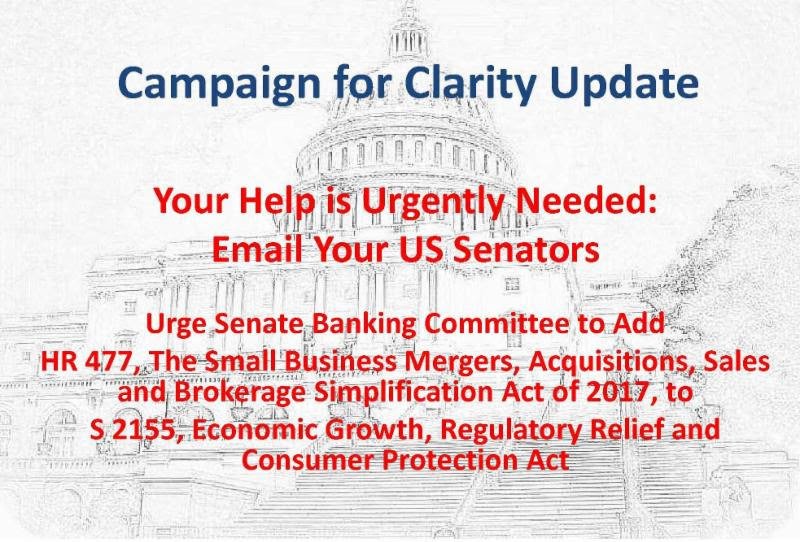 Your US Senators urgently need to hear from YOU that this bill is important to you, and to buyers and sellers of privately held businesses in your state. Use this link: Email your US Senators NOW! to email your US Senators and ask them to urge the Senate Banking Committee to add HR. 477 to S. 2155, Economic Growth, Regulatory Relief, and Consumer Protection Act, which is scheduled to be debated on the Senate floor as early as this week. NO NEED TO LOOK UP YOUR SENATORS' NAMES AND ADDRESSES. NO NEED TO CUT AND PASTE. JUST CLICK, AND ENTER YOUR ZIP CODE, NAME AND ADDRESS! Email your US Senators NOW! Passage of this small but important bill will codify the regulatory relief envisioned in the SEC M&A Broker No Action Letter, and will harmonize federal law with proposed changes in state securities laws. It is strongly supported by the North American Securities Administrators Association (NASAA) which formally adopted its Model State Rule on September 29, 2015. NASAA's Model State Rule, which closely parallels the language in HR. 477, and is now in the process of being adopted state by state. As ever, please don't hesitate to call/contact me, or one of my co-chairs, Jim Cornell (President, Praxiis Business Advisors, 716.675.6001 x223, cornelljim@aol.com), John Johnson (President, IBG /Bluestem Resources Group, (918) 749-6016, JJohnson@bluestemusa.com), or Linda Purcell (Founder, Purcell Associates, LLC, (847) 358-9404, lpurcell@purcellasc.com) if you have any questions or suggestions regarding this matter.